BLOW OUT YOU BUGLES OVER THE RICH DEAD! THERE’S NONE OF THESE SO LONELY AND POOR OR OLD BUT, DYING, HAS MADE US RARER GIFTS THAN GOLD. THOU ART BEING AND BREATH, AND WHAT THOU ART MAY NEVER BE DESTROYED. "So long but not goodbye." "Cheer up there's a rainbow in the sky." He is buried in grave IQ40, Albert Communal Cemetery extension. unmarried, his next of kin was his sister who lived in London and that he had enlisted (volunteered). He was the son of Henry Edwards, 16 Mitchell Cottages, Blackheath. 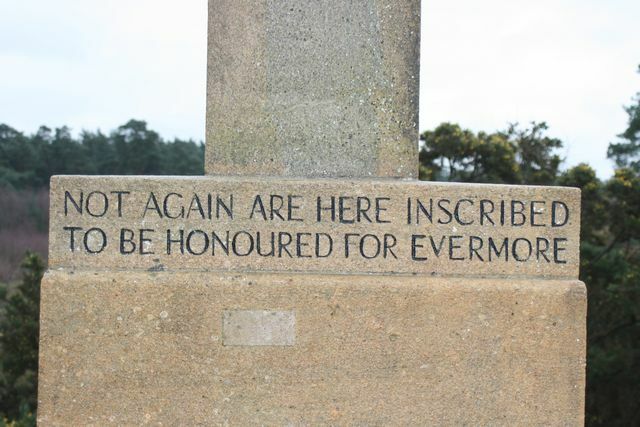 I believe the information on the plaque to be incorrect. 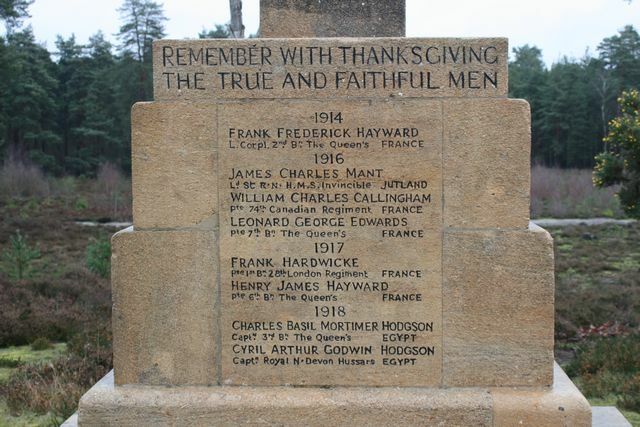 The date is wrong according to the Commonwealth War Graves Commission and the other major authority “Soldiers died in the Great War” and I cannot find Ferincourt, the place where he is stated to have died but there is a village of Fricourt which flanked “Sausage Valley”. He was killed in action on 30 October 1917 in the Second Battle of Passchendaele (26 October-10 November 1917), a phase of the Third Battles of Ypres. He was 23. His Medal Card spells his name as Hardwick as does his civil birth registration. 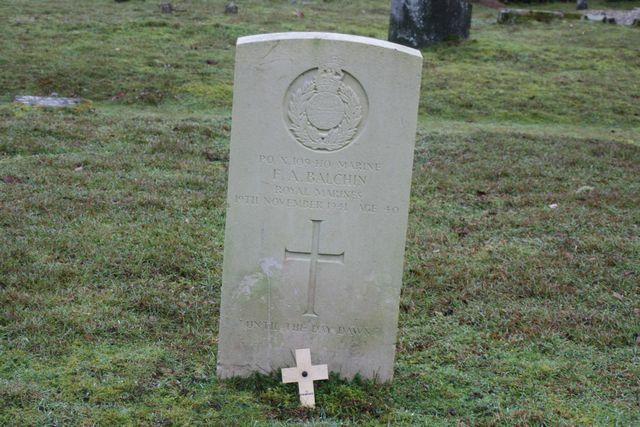 His Mother had re-married in 1909 in Farnham. 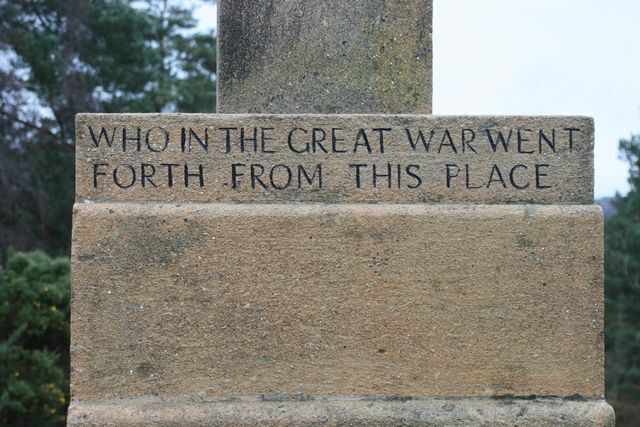 He died from his wounds on 24 August 1917. He was 23. He was the son of Mercy Leigh (formerly Hayward), 5 Mitchells Cottages, Blackheath and the late Sydney F Hayward. 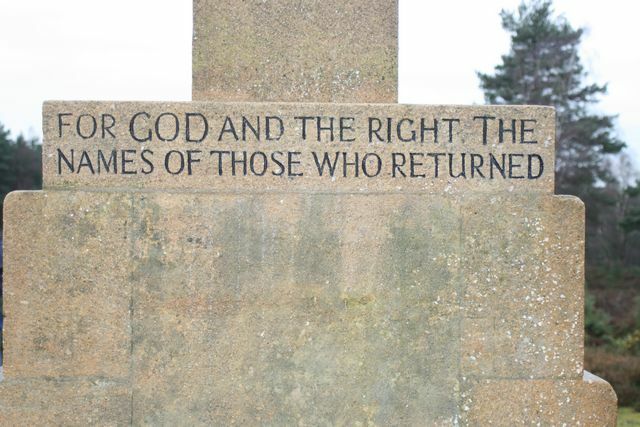 He is buried in grave I K 27, Monchy British Cemetery, Monchy le Preux near Arras. His Medal Card states that he was an Acting Sergeant. It is recorded that he had been a Queens Messenger. Captain, attached to 2nd/24th (County of London) Battalion (The Queen’s) London Regiment, 181 Brigade, 60th Division. 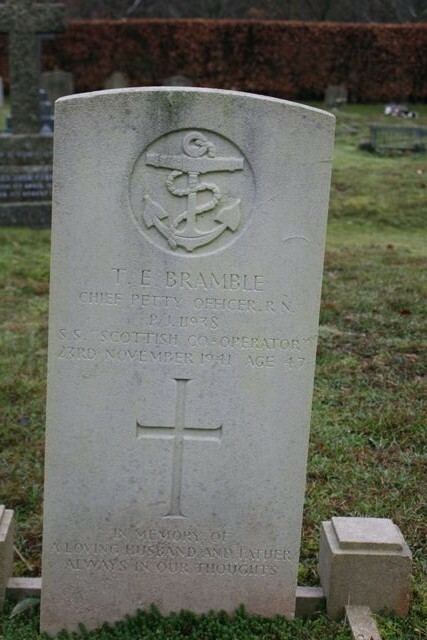 He was formerly Captain, 3rd Battalion, The Queen's (Royal West Surrey Regiment). He was the son of Charles D and Emily Hodgson, The Hallams, Shamley Green and the husband of Mary A Hodgson, North Canonry, Salisbury. He was the brother of Cyril, see next entry. Captain, 16th Battalion (Royal 1st Devon & North Devon Yeomanry) Battalion T F, The Devonshire Regiment 229 Brigade, 74th Division. 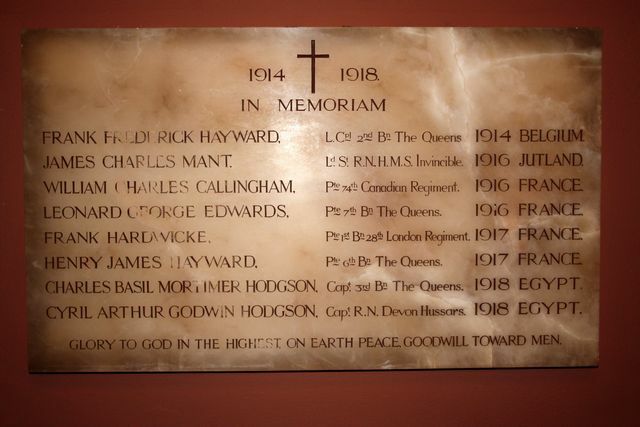 He was previously 2nd Lieutenant, Royal North Devon Hussars. Royal North Devon Hussars was a cavalry regiment based in Alexandria, Egypt but they “dismounted” in 1917. He was the son of Frederick and Charlotte Mant, White Cottage, Blackheath. fought in the Battles of Heligoland Bight and the Falkland Islands when, with her sister ship HMS Inflexible, sank the German armoured cruisers Scharnhorst and Gneisenau almost without loss. 30 May 1916, the entire Grand Fleet, under Admiral Beatty was ordered to sea to look for the German Fleet. HMS Invincible was the flagship of the 3rd Battle-Cruiser Squadron under Admiral Hood and the three battle-cruisers sailed ahead of the main fleet. 31 May at 05:53 HMS Invincible found the Wiesbaden and opened fire with the other battle-cruisers joining battle two minutes later. oncoming torpedoes, but all three of them turned to present their narrowest profile to the torpedoes. All the torpedoes missed but, as HMS Invincible turned, her helm jammed and she had to come to a stop to fix the problem but this was quickly done and the squadron reformed. 06:21 The German battle-cruisers were 9,000 yards (8.2 km) away and the Battle-cruisers almost immediately opened fire on their flagship Lützow as well as Derfflinger. HMS Indomitable hit Derfflinger three times and Seydlitz once, while the Lützow quickly took 10 hits from HMS Lion, HMS Inflexible and HMS Invincible, including two hits below the waterline forward. 06:30 HMS Invincible abruptly appeared as a clear target for Lützow and Derfflinger. The two German ships fired three salvoes each at HMS Invincible and she sank in 90 seconds. At least one 305 mm (12 inch) shell from the third salvo struck her midships 'Q' turret. The shell penetrated the front of 'Q' turret, blew off the roof and detonated the midships magazines, which blew the ship in half. 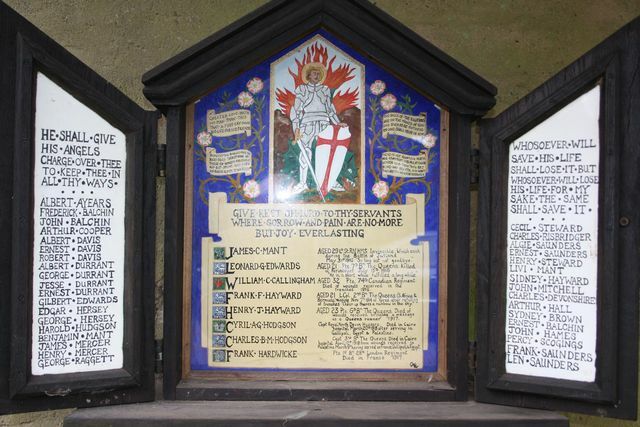 Of her complement, 1026 officers and men were killed, including Rear-Admiral Hood. There were 6 six survivors. He was the son of James and Dorcas Balchin and the husband of Ivy E Balchin of Kirkcaldy. He was the son of James and Sarah Bramble and the husband of Millicent A Bramble of Wonersh. He died of his wounds on 7 August 1916. He was 22. 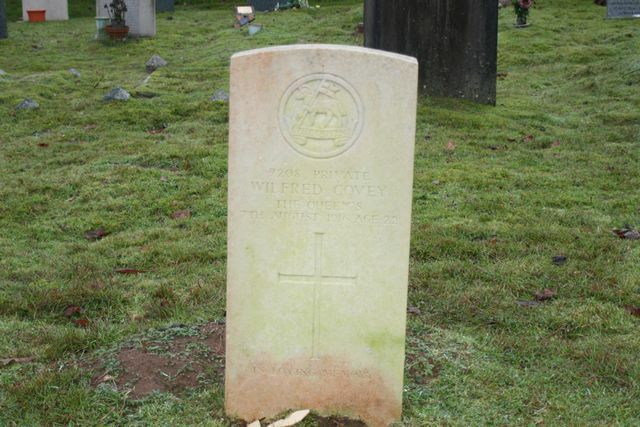 He was the son of Luke and Jane Covey, 10 Lawns Mead, Wonersh.